Bill and Dave during the war years. Photo courtesy of Hewlett Packard Company. William Redington Hewlett was born on May 20, 1913 in Ann Arbor Michigan . He moved to California in 1916 when his physician father took a position at the Stanford Medical School. As a boy, Bill developed a keen interest in science. He loved to tinker and had he chosen differently, he might have followed his father into medicine. Bill also struggled with dyslexia. This handicap forced him to develop a very strong memory. At Stanford University , he rarely took notes, and listened intently instead. Bill's father died when Bill was twelve. Bill moved to Europe with his mother for fifteen months before returning to San Francisco to attend Lowell High School. Bill enrolled at Stanford in 1930 where he met David Packard. Like Dave, Bill majored in electrical engineering and received his BA degree in 1934. He went on to earn a master's degree in electrical engineering at Massachusetts Institute of Technology in 1936, then returned to Stanford to earn an engineers degree in 1939. Bill married University of California – Berkeley graduate Flora Lamson in 1939. Together, they had five children. Flora died in 1977. Bill married Rosemary Bradford in 1978. In 1966, the Hewlett family established the William and Flora Hewlett Foundation to administer the family's philanthropic activities. The foundation was a very generous giver and Bill was very humble about it. Stanford University was a major beneficiary of the foundation (almost $400 million), but no Stanford building was allowed to carry the “Hewlett” name. The “Hewlett” name went onto Stanford's electrical engineering center after Bill died. Throughout his life, Bill was a very keen outdoorsman. He owned numerous country properties and owned cattle-ranching operations in California and Idaho along with Dave. Bill enjoyed mountain-climbing, hunting and fishing. Bill was a hands-on engineer during his entire career. He held numerous patents and was a member of the National Academy of Engineering, the National Academy of Sciences and the American Academy of Arts and Sciences. In 1985, Bill was awarded America 's highest scientific honor – the National Medal for Science. He also received fourteen honorary degrees from various universities. Bill also had many business and social interests outside of HP. Among others, he served directorships at FMC, Chrysler Corporation and Chase Manhattan Bank. During the Johnson administration, Bill was a member of the President's Science Advisory Committee and the President's General Advisory Committee on Foreign Assistance Programs. Bill died on January 12, 2001 at the age of 87. David Packard was born on September 7, 1912 in Pueblo Colorado . Pueblo was a rough town. In Dave's words “ Pueblo in 1912 resembled less a Midwestern farm community than it did a western frontier city.” His mother was a high school teacher and his father was a lawyer. Dave had an early aptitude for science and math which was encouraged by his parents. As a boy, he built models and conducted experiments in his back yard. He experimented with explosives and injured his left hand while encasing what today would be called a pipe bomb. Dave also developed an interest in radio and became an early ham radio enthusiast. Dave was a big man (6 feet 5 inches) and very athletic. In high school, he made the all state basketball team and won the state high jump, discus, high hurdles, low hurdles and long jump. He was the president of his high school class all four years and played football at Stanford University . Dave enrolled at Stanford in 1930 and earned a BA degree in electrical engineering in 1934. While Bill went on to further study, Dave moved east to take a job with General Electric. Dave's first job was testing refrigerators before moving into the radio transmitter department and then into vacuum tube engineering. It was at GE that Dave learned and developed many of the concepts that would become fundamental in “The HP Way”. Dave married Lucile Salter of San Francisco in 1938. They had four children together. In 1964, Dave and Lucille founded the David and Lucille Packard Foundation to support universities, hospitals, youth services agencies, community groups and other organizations. Lucile died in 1987. Like Bill, Dave was also an avid outdoorsman. The two men spent a lot of time hunting and fishing together along with many other top HP managers. Dave's other business experience included directorships at Genentech, Caterpillar, Chevron Boeing and other companies. Dave died at the age of 83 on March 26, 1996 . 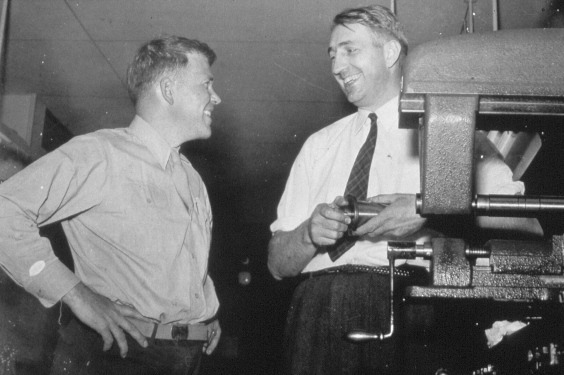 Bill and Dave were friends at Stanford and reunited in 1939 to form Hewlett-Packard. From an HP perspective, the most significant influence on the two was Stanford engineering (iconic) professor Frederick Terman. Terman had a vision for the development of an electronics industry in California to rival that on the east coast. Beginning in their university days and continuing for several decades after the establishment of HP, Terman encouraged and advised Bill and Dave. The founding of HP is generally considered to be the birth of Silicon Valley . Of the two, Bill was the more talented engineer. He designed the company's first product – the 200A audio oscillator. Throughout his career, Bill spent a lot of time at HP labs. He issued the famous challenge to HP engineers to provide the functionality of the 9100A desktop calculator (1968) in a device that could fit into his shirt pocket. The result was the revolutionary HP-35 in 1972. Bill is also rumored to have contributed to the power supply on the 2100A in the early 1970s. Dave was the primary business driver of the two. Together, Bill and Dave developed the company's culture “The HP Way”. Dave was particularly passionate about focusing on the company's number one corporate objective – profitability and the corresponding accountability required. Profitability was “the objective that makes all other objectives possible.” Dave was also a firm believer in decentralization as the best way to foster the development of HPs culture as the company grew. Dave did not believe in “professional managers.” He believed that the best managers were those who had detailed (eg technical) knowledge of the areas for which they were responsible. Bill stepped down as HP CEO in 1978 when John Young was appointed as his replacement. Bill continued on HPs board of directors. Dave retired from HP in 1977 but continued as chairman of the board. Both Bill and Dave became much more active in the company in the late 1980s when HP performance waned. They personally visited product divisions and spoke to staff about the company's challenges. Dave was also very active in selecting a replacement for John Young in 1992. Click here for more details on the early days of Bill and Dave and The HP Way. 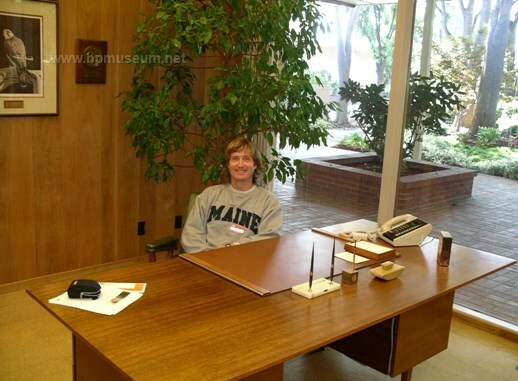 The Curator Behind Dave's Desk at 1501 Page Mill Road, Palo Alto. To their great credit, HP has maintained Bill and Dave's offices in their original 1960s splendor.